Australians and New Zealanders are pretty used to listening to different accents, especially British and American accents, from the TV, movies, internet and other media, and we're pretty used to not being able to buy much software with our accent(s). I've been putting long lists of good early literacy iPad apps and computer activities in this site's Phonics Resources section, and wishing they had different accents, and especially an Australian accent option. After all, there are 22 million of us Aussies, and nearly 5 million Kiwis, and it's hard enough to hear the differences between vowels in your own accent when you're starting out, without having to work in different accents. Though probably from a population point of view, Indian English is ahead of us in the queue. 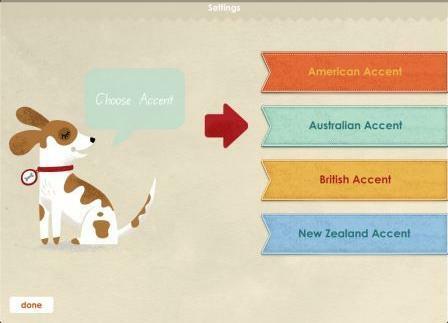 Now I've found a couple of early literacy apps that give you a choice of different accents – not only a UK or a US accent, but also an Australian and New Zealand accent. Little kids with Kiwi accents, or whose parents have Kiwi accents, can get terribly confused about the vowel in "fush and chups", so I'm sure these apps will be very popular there as well as here, while still serving the bigger US and UK markets. Oz Phonics also have some nice little YouTube clips that demonstrate sounding out words in different accents, which I thought would be good to show little kids as a demonstration of how to tackle reading words, since they are a screen-obsessed Gen Wii lot these days. I'll put the Australian one below, but the others and a few other cute things, like trance dancing vowels, are all on the Oz Phonics Youtube channel, plus they have some free downloadable worksheets on their website as well. Noice. This entry was posted in blending and segmenting, Fun, phonics activities, phonics games, reviews, sound-letter links, sounds, spellings, vowels, word attack on January 31, 2013 by alison.